Three reservoirs, named for corresponding dams on the Gunnison River, form the heart of Curecanti National Recreation Area. Panoramic mesas, fjord-like reservoirs, and deep, steep, and narrow canyons abound. Blue Mesa Reservoir is the largest lake in the state of Colorado. It’s 20 miles long and features 96 miles of shoreline to explore. Blue Mesa is a recreationalist’s dream. Options for play include sailing, power boating, fishing, and water skiing. Windsurfing is popular among those looking to get a workout on the water. Swimming for any extended period of time is not really recommended. The reservoir is fed by snowmelt streams and rivers so it can be pretty chilly. If you are looking to swim, waiting until later in the summer after it has had time to warm up is advised. No matter what, you’ll probably want to bring a wetsuit. Boaters of all types on Blue Mesa should be aware that strong afternoon winds, sometimes accompanied by storms, can cause hazardous conditions. Be weather-wise. Watch for threatening cloud build ups. As soon as strong winds begin to blow, head for shore. The Blue Mesa Reservoir offers some of the best fishing in the state and the largest Kokanee Salmon fishery in the country. Even when local rivers are high, you can hook big fish in the Blue Mesa. Or visit during winter and try ice fishing. Be sure to check out our Fishing Page for insider information from local guides. If you’re looking to get the most out of your fishing trip to the Blue Mesa, hire one of our local fishing guides and they’ll take you to all of the best locations for catching big fish. From camping to cabins, the options for Blue Mesa lodging are endless. Check out our Gunnison Lodging Page for the options closest to the reservoir. Or check out our cabin rentals page for all the insider info on Blue Mesa cabins. Some of our partners even offer on-site fishing guide services. In order to protect these valuable recreational waters, all motorized watercraft launching in Curecanti National Recreation Area are required to be inspected for invasive mussels and, if necessary, decontaminated in accordance with procedures set by the Colorado Department of Wildlife. 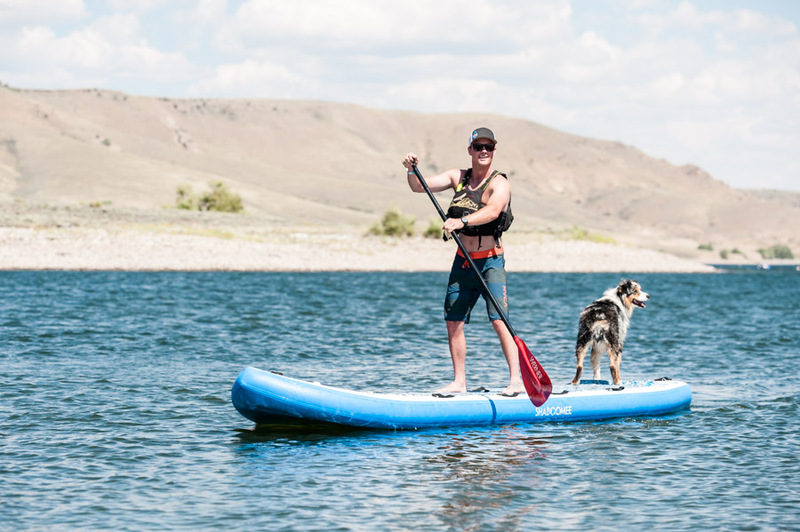 In addition to the mandatory inspection prior to launch, all motorized watercraft leaving Blue Mesa, Morrow Point, or Crystal Reservoirs will undergo a second inspection to verify the watercraft has been cleaned, drained and dried. In 2012 new regulations were adopted that address non-motorized watercraft. For more information on inspections, please visit the park website to find out more about current inspection regulations. Starting November 1, 2017 all boat inspections will be done on a call-in basis until ice-on. The number to call is 970-209-2335. Park employees will try to maintain a 20 minute response time, but may be delayed by construction and traffic so call ahead as soon as you know what time you’ll be there. Bringing your own boat? All motorized and/or state-registered vessels on Blue Mesa Reservoir will be required to have a boat permit. These user fees are half-price for those visitors who possess the Federal Interagency Senior or Access Pass. Hiking trails, fishing, boating, windsurfing, cross-country skiing, snowshoeing and ice fishing make Curecanti a recreational draw. Other activities include wildlife viewing, kayaking, nature walks, rafting, horseback riding, climbing, camping and birdwatching. Be sure to enjoy the area’s “classified stable skies” for stargazing classes with a National Park Ranger at Elk Creek Visitor Center. For more information about ranger programs and activities, contact the park at (970) 641-2337, extension 205 or visit the park website at www.nps.gov/cure. 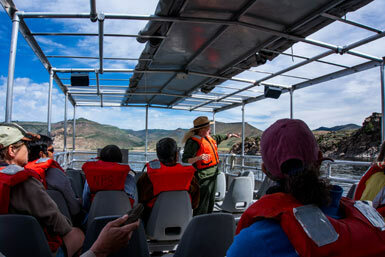 The Morrow Point boat tour provides a chance to see the Black Canyon from the bottom offering spectacular views unmatched by any other experience in the area. These 1 ½ hour tours run twice daily in summer months (except Tuesdays) at 10:00 AM and 12:30 PM and are guided by a Park Ranger who will teach you about the geology, wildlife, the narrow-gauge railroad, and more. Typically tours run early June through Labor Day and reservations open April 16. Walk-ons are not permitted. Call (970) 641-2337 extension 205 for start dates or to make a reservation. Special tours for educational groups are available upon request. If you prefer to explore the waters of Curecanti on your own, some areas are accessible to private boats. Boat rentals and more are available through Elk Creek Marina. If you do decide to explore on your own, make sure to go through this safety checklist prior to setting out. Personal flotation devices (PFDs) of correct size and type for all passengers. PFDs are required for children under the age of 13 unless the child is below deck or in an enclosed cabin. Always wear your PFD (children under 13- required). Don’t overload, stay within capacity limits of your craft. Don’t stand up in the boat. On river sections, don’t hesitate to portage. Report all accidents to a park ranger. Visitor contact stations are located at Elk Creek, Lake Fork, Cimarron and East Portal.